You know how much havoc drinking alcohol wreaks on your liver, right? Of course, you do. The negative effects that alcohol has on your liver are well-known and well-documented. Maybe you'll just wait until dry January. But what if you could enjoy alcohol without worrying about the negative effects on your liver? This is surprisingly simpler than you might think. Read on to learn about the surprising health connection between turmeric and alcohol. Turmeric is a bright yellow spice often used in Indian (and other Asian) dishes. It is this ground-up root that gives curry powder it's strong, cheerful yellow color. In addition to eating it, people in India and other Asian countries have used turmeric medicinally as well for thousands of years. Modern science is now catching up and realizing that they were onto something. These health properties alone are a great reason to start looking to get more turmeric in your diet. But there may be one more for the party animals among us. Let's look at the benefits of turmeric as it concerns alcohol. The effects of alcohol on your liver appear in alcoholic liver disease. Most people typically have to keep up a pattern of heavy drinking for many years for symptoms to manifest. But some unlucky folks may be genetically predisposed to develop the disease easier. Plus there are other contributing factors such as nutrition and gender. Sorry ladies, women are more susceptible than men. Once the symptoms of this disease begin to manifest the only way to resolve the problem is with treatment, the right nutrition, and by never touching alcohol again. Once the disease progresses through stage three, the prognosis becomes very dire. However, the active component in turmeric, curcumin, has been found to provide positive benefits for a variety of liver disease. This includes alcoholic liver disease. How does it work? The liver is your body's own personal toxin filter. It generally does a pretty good job. However, if you overload your poor liver by drinking excessively, this overworked organ can become damaged. Curcumin has been shown to help prevent liver fibrosis (scarring and damage to the liver). Inflammation is another common problem with the liver as a result of too much alcohol, although it can manifest as a withdrawal symptom. Thus the powerful effects of curcumin's anti-inflammatory properties help out here too. One of the early indications of alcoholic liver disease is when the liver is damaged enough that it can't break down fats. They then begin to accumulate in the liver causing more scarring and damage. Turmeric helps with this by regulating both the formation of fatty acids and fat metabolism in the body. Drinking too much alcohol also isn't very good for your brain. The problem with alcohol is that it can cross the blood-brain barrier and wreak havoc. It can cause oxidative damage and inflammation that can damage neurons and even cause problems with cognitive processing. Turns out your mom was right when she said that drinking too much alcohol makes you a little dumber! Turmeric can once again save the day. Remember that curcumin has both antioxidant and anti-inflammatory properties? Thus, curcumin can both protect your brain from damage and even help it to heal after sustaining a little damage. For turmeric, or more specifically curcumin, to be effective you need to get quite a bit of the ingredient. A standard dose for an adult would be anywhere from 400-700mg of turmeric powder a day. Or you could opt for 1.5-3g of the cut root itself. Eating straight turmeric root is not the most pleasant culinary experience. And dumping copious amounts of straight turmeric or curry powder on your food is not the most effective method either. Not only will your food probably not taste good with that much spice added, but also your body has a difficult time absorbing curcumin in that form. Since the whole point is to get an adequate dose of curcumin, another method is necessary. 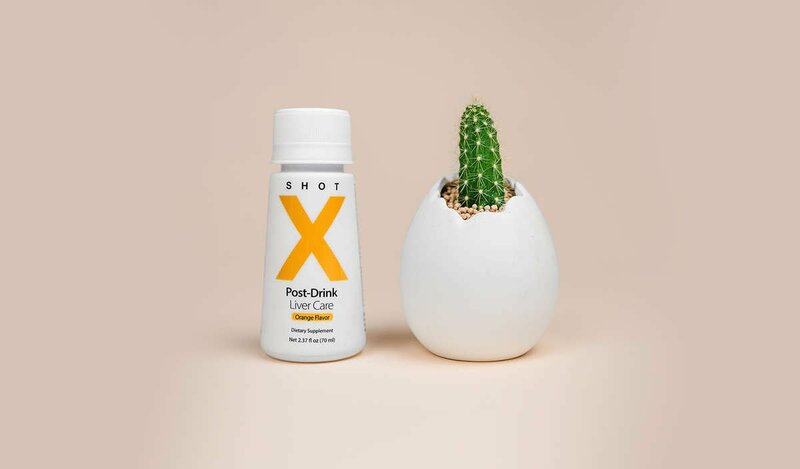 Enter Shot X, a delightful, delicious way to get a healthy dose of curcumin. The curcumin in Shot X is an impressive 185 times more bioavailable than the curcumin found in turmeric. The formulation also contains various other ingredients that help with hangovers and other effects of a night of drinking. There is a dose of electrolytes for a refreshing burst of energy. Plus, some amino acids for combating that post-party fogginess. Wondering how you're going to choke down this wonder drink? You don't have to because, unlike "medicine", this drink has a delightful orange creamsicle flavor that is just as enjoyable as those cocktails you savored. Of course, there is nothing that will protect you from all the negative effects of a life of heavy drinking. Physical effects aren't the only ones that excessive alcohol consumption can cause. However, this surprising connection between turmeric and alcohol can help the responsible drinker enjoy a few drinks on occasion without feeling guilty about the effects on their liver. Ready to order your first box? You're just in time for the holiday season. Now you can enjoy all the spiked eggnog you like without worrying about your poor little liver. Check out Shot X today to get started!